Since it’s initial launch back in 2005, God Of War has embraced and redefined the action-adventure genre by providing a series with iconic characters, a gripping storyline, and an insanely fun combat system. This February, Visceral Games and EA partnered up to create Dante’s Inferno, a title loosely based on poetry by Italian icon Dante Alighieri. While the imagery and content have all the makings of a great game, the lack of original combat and repetitive gameplay keep this title from reaching it’s full potential. Here is a further analysis on the positives and negatives of the overall experience. 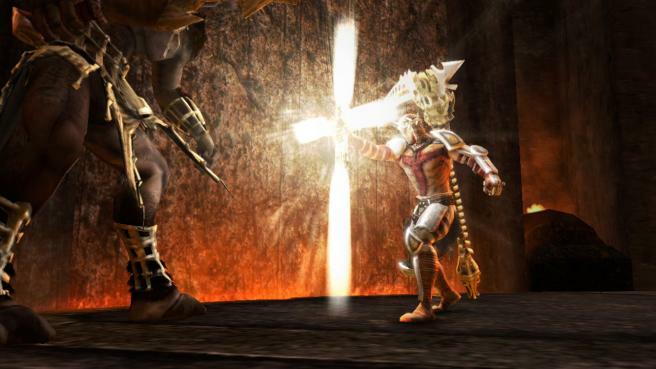 Dante’s Inferno is a third person action-adventure game inspired by the epic poem, The Divine Comedy. The story structure behind this infamous piece of literature contains three chapters that follow the hero’s exploits as he travels to Hell, Purgatory, and Heaven. The player assumes the role of Dante, an arrogant veteran soldier during the Third Crusades, who journeys to the depths of hell to free the soul of his beloved soulmate Beatrice. Throughout exploring the 9 circles of Hell, Dante is humbled by the effects of his earlier sins in life and is forced to complete rigorous tests to survive. The primary weapon in your arsenal is a Death Scythe that becomes available after having defeated Death himself. This weapon essentially allows you to pull off devastating combos and evasive maneuvers when surrounded by enemies. A secondary weapon of choice is the Holy Cross, which emits strong bursts of light designed to fry your adversaries after several hits. As you emerge victorious in certain boss battles, you are rewarded with magical abilities. Your character starts off with 4 slots designated for magic that become upgradable over time. This addition is vital because the use of magic adds further dynamic to the combat mechanism. There are also several fountains found throughout the game that allow you to restore health and magic once they have become depleted. The idea of coupling magic with traditional combos and QuickTime reaction events in big boss battles is one of the main reasons why the combat mechanics are enjoyable. After seeing how the fighting aesthetics are expressed, one can’t help but make the God Of War comparisons. However, the difference lies in the graceful nature that one has over the other. Kratos makes killing an art form that Dante can only hope to achieve someday. One of the strongest aspects of the game comes in your decision to choose the fate of sinners you meet along the way. Notable sinners like Pontius Pilate make appearances and are well defined by the sins they committed in their previous lifetimes. When you approach a condemned soul you are presented with the option of punishing or absolving them at your own discretion. When choosing to free them of their sins you have to participate in a timed mini-game where you tap the buttons on your controller to capture sins as they move through a cross. Likewise, choosing to punish them becomes more favorable as a brutal execution scene is portrayed. Regardless of which option you choose you still collect souls that can be used to purchase upgraded abilities. Eventually you’ll reach Level 7, giving you the power to max out either the Holy or Unholy Path and become unstoppable in every battle. While this concept takes time to materialize, there is no further emphasis on the consequences of your actions. Games today have touched upon the importance of choice, which is a standard this title fails to exploit in full detail. 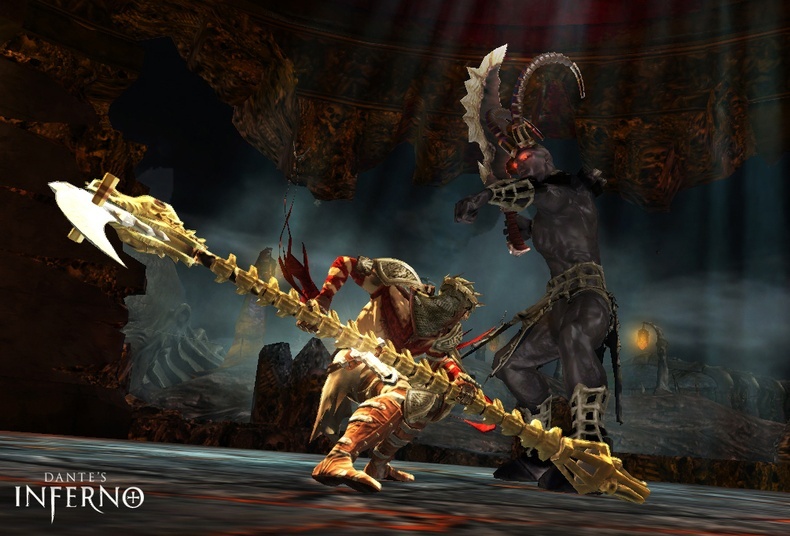 Dante’s Inferno is the first in a series of games with the primary iteration being set in hell. For that theory alone, the depiction of Hell is rather disturbing and not necessarily in a good way. The level designs start out impressive but gradually dip in quality over time. When traveling through each circle of hell there are distinct areas that capture the personality of the atmosphere. For example, Gluttony is best demonstrated by showing a region that resembles the inside of a stomach. Likewise, each group of enemies that you fight are designated to that particular area they are associated with until you reach the end of the game. The puzzles can be frustrating firsthand, but gradually become easier over time.Even the boss battles fail to stay consistent throughout the game. While facing both Cleopatra and Mark Antony during the Lust Level is fun, the same can’t be said for later stages. It would have been better off to end each level with a boss battle to signify that you are entering the next stage of Hell. Another annoying aspect of the game is the repetitiveness of enemy encounters. You’ll always be in a situation where you’ll be cornered and without knowing the proper maneuvers you run the risk of taking serious damage. After a while the combat stops being fun and starts being somewhat of a chore, a feat no game should ever strive to be. When it comes to length, the campaign logs in at only 5-6 hours depending upon the difficulty setting you choose. This alone is an insult as the actual time spent fighting is quite shorter. A great deal of the time you’ll be watching cinematic videos which tell the story as you’re playing. This starts out as a great concept but quickly becomes overkill by the time you reach the climax of the plot. Once you beat the game you’ll have the option of playing through a second time with the upgraded abilities already intact. For achievement whores this will allow you to finish collecting all the unlockables that you might have missed out on the first go around. Other then that, your time would be better spent waiting for the definitive experience God Of War 3 will bring. Lastly, upon beating the game you’ll also unlock the Gates Of Hell mode. This is a stage where you’re placed in a battle area and face off against 50 waves of enemies. This isn’t anywhere as fun as the Horde mode in Gears Of War 2 unless you enjoy the combat system in the actual game. There is the promise of multiplayer DLC titled The Trials Of St. Lucia scheduled to drop sometime in the spring. However my guess is that by the time this happens this game will be long forgotten among the flurry of games that will become available in March and April respectively. Dante’s Inferno is a lackluster action-adventure game that tries to make it’s name by copying all the aspects that made God Of War a rewarding experience. While the story content brings about the delicate subject matter of morality to the table, the flawed method of execution keeps it from standing out on it’s own merits. Perhaps the most painful thing about this game is that given the source material you would think the studio would be able to craft a memorable experience for years to come. Instead the reality is that playing this game is the equivalent of being stuck in Hell for all eternity. If you absolutely have to try it out I recommend that you rent a copy instead of buying one. Otherwise, your money is better spent either waiting for God Of War 3 or for this game to reach bargain bin status. Then and only then would Dante’s Inferno be a guilty pleasure worth trying out.